Michaela, God still loves you…. Sometimes I realize things, and I am shocked at how really slow on the uptake I have been not to have realized those things before. I feel I need to apologize, Michaela, because I am not sure that in all these blogs I have ever told you this one thing: God still loves you. Before you were kidnapped, I had told you a lot of things. I had told you that I loved you and that I would always take care of you. I had told you that if ever you were sad or lonely and I wasn’t there all you had to do was touch your heart, and you would find me there. I had told you that if ever you needed help that you should ask God, and that God would help you. The first of my promises, I was not able to keep, and I am so very sorry for that. I only hope that you won’t decide nothing I said was true because of that, because the rest of it is. I am in your heart, as you are in mine. You might forget me, might forget what I look like, might forget my name, could even forget that I ever existed, but I am still in your heart and I am still loving you, wherever you are, anywhere in this world, or in the next. The third promise … well, you would be in a better position than I am to say whether God helped you or not. He could have helped you in ways I couldn’t possibly imagine. You could have a better relationship with him than I do, know him far more intimately. Should you ever come home, it could be that you will be the one to teach me. But one of the things that has always haunted me is a moment that might have come when you felt abandoned, by me, and by God, when you surrendered to whatever may have been your fate with the knowledge that help was not going to come, no one was going to save you. That is such a heart rending thought to me, that I have never carried it terribly far from there. Not until just this past week, anyway, when it suddenly occurred to me that you could be alive out there somewhere, and you could still feel abandoned, helpless and hopeless. If you are reading this blog, of course you know that I still love you, that I still long for you to come home. But I can’t reach out my hand far enough to touch you, to help you, to take your hand and lead you away from wherever you are. But God can. Wherever you are, you are not alone. This is what I know for an absolute fact. All you have to do is open your heart up just a little bit to God, and he will come in. He will call to you. He will sing to you. He will love you with a love that is so soft and gentle it feels as though it will blow away if you breathe on it. But it won’t. Touch it and it will grow stronger, will fill you with joy and will make you want to dance. I know this. I guarantee it. It may happen over a period of time. Once I opened the door to God and then forgot I’d done it and walked away, but behind all the noise of my life he kept calling until I said, oh, huh, it’s you, God. It may happen instantly or overnight, as has happened to me. I have walked away from God more times than I care to admit, but all it has taken is a word and he has picked me up and loved me like … well, like a missing child who has been found. But once you are his, you are always his. And you, Michaela, are his, and if you are not in his presence now, all you have to do is call to him and he will be there for you. The picture above is one of my favorites. It is called Jesus Reached Down. 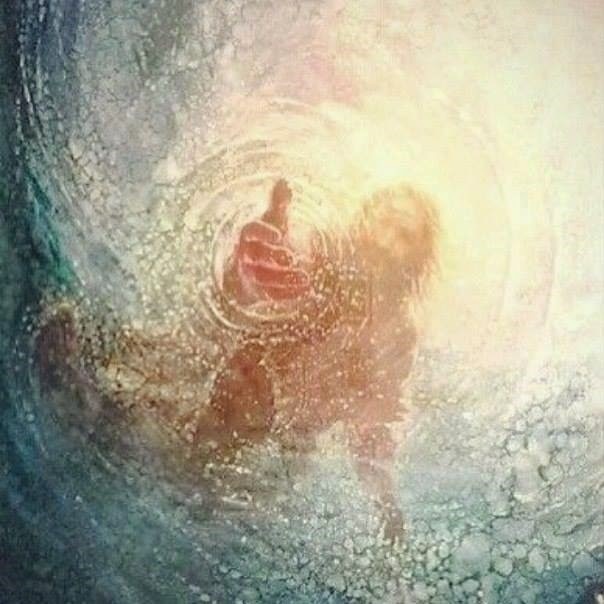 But he is reaching underwater, to save someone who is drowning. When we run out of air, when we run out of hope, he will be there. I have no idea what you have had to endure since the moment you were grabbed and stolen away. Nor can I tell you why things like that happen, how it could be that God could have allowed you to be kidnapped in the first place, or why he didn’t answer my prayers, your prayers, the millions of prayers offered for you over the years, to bring you home safely. But I do believe as the Bible says, that “All things work together for those who love the Lord and are called according to his purposes.” And this I believe, also, that you, Michaela, have a light. You were born with a light. Those who knew you could see it when you were here, and it shines just as brightly now, even though you yourself are hidden from us. You have been a gift to the world in your presence, and you have continued to be a gift to the world in your absence. So many hearts and lives you have touched, Michaela. If you were to come home, you would not ever have to worry about being ashamed about where you had been or what has happened to you. The world loves you, baby girl. I love you. God loves you. You have a very special destiny … to touch the world in its heart, and create love. I have been reading a book this week, called Unspoken by Dee Henderson. It is about a woman (Charlotte) who had been kidnapped for four years, between the ages of 16 and 20. And what Charlotte says is that she could never believe in a God who would have forgiven the men who had hurt her. That thought kind of startled me, not that she couldn’t believe in God because of what had happened to her, but because God would have been willing to forgive and love the men who had hurt her. This is true, though. Many years ago I wrote about God’s love for Nancy Garrido. I want to write now about God’s love for whoever is responsible for Michaela’s kidnapping. I have always know this, God’s love for you, and God’s sorrow for you, from the moment I first laid eyes on the composite. So I say to you, too … God is there. He is real. Open the door of your heart just a crack and he will come in, and change your life and change your heart, whether you are the person who kidnapped her, or anyone else who was involved in any way with Michaela’s kidnapping, or anything else for that matter. “Behold, I stand at the door and knock” is what Jesus said. All you have to do is open the door. Michaela, of course I have to say again, if you are still alive please come home. You can do it. With God’s help, you can do it. But most of all, what I want is for you to be at peace, for you to be happy. Until we meet again, and we will, just know that I love you forever baby girl. P.S. I viewed the deeply touching godvine.com video you posted on Michaela’s FB page. The circle of love life experience reminded of a tender & beautiful Loveyou website quote :. “See there's this place in me where your fingerprints still rest, your kisses still linger, and your whispers softly echo. It's the place where a part of you will forever be a part of me.”-Source Unknown”God Bless you in special ways not yet experienced is my prayer. When I read the poem your sweet girl wrote over there to the right on the blog, it made me think the scripture passages from Isaiah 61 and Luke 4. “The Spirit of the Lord God is upon Me,Because the Lord has anointed MeTo preach good tidings to the poor;He has sent Me to heal the brokenhearted,To proclaim liberty to the captives,And the opening of the prison to those who are bound;2 To proclaim the acceptable year of the Lord,And the day of vengeance of our God;To comfort all who mourn,3 To console those who mourn in Zion,To give them beauty for ashes,The oil of joy for mourning,The garment of praise for the spirit of heaviness;That they may be called trees of righteousness,The planting of the Lord, that He may be glorified.” Because it's prophetic in nature, I don't fully understand what they mean (though it's obvious Jesus is the one referred to within), but I particularly like the parts about “He has sent Me to heal the brokenhearted,To proclaim liberty to the captives,And the opening of the prison to those who are bound”. It makes me think of people wrested away from their families against their will, not just children, but prisoners being held the world over in dark places, imprisoned for the cause of Christ. We can't see or understand all the whys with our human eyes, but one day…it'll all make sense. Until that day, we continue to pray that your sweet daughter and so many others being held against their will around the world can come home at last…and how that would truly “console those who mourn in Zion,To give them beauty for ashes,The oil of joy for mourning,The garment of praise for the spirit of heaviness”. hi ms sharon,visiting your website after a long time. just finished reading all your latest blogposts.i was wondering do you have a gofundme page where people can donate and help you financially? let me know please because i would really love to help you out and this is the only way i feel i can help you from afar. Thanks Chandler, but I don't have a gofundme page. When I write my book you can buy it, how's that? Meanwhile, your caring and support mean a lot.